"The first time we saw the healing power of horses for children in crisis, we were truly amazed and very grateful to have had the opportunity to be a part of such a wonderful experience. This healing bond is often written about by those who have witnessed it, but experiencing it first hand literally makes your heart swell with emotion. This foundation is meant to provide extraordinary children with a wonderful, life memory." The Hastings-based StarBrite Equestrian Foundation is a group of friends who have been blessed with many years of detailed knowledge of horses and their powerful ability to connect with children. We have formed an equestrian foundation with a special mission -- to harness that connection and its healing power for children in crisis. StarBrite Stables Equestrian Foundation is an organization making a positive difference for children living with social, emotional, or physical challenges including terminal illness. 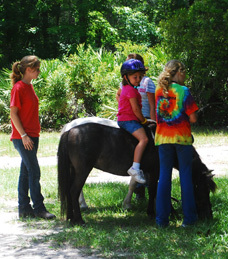 Participating children develop confidence, integrity and responsibility through mentoring and peer relationships centered on the care and enjoyment of horses. 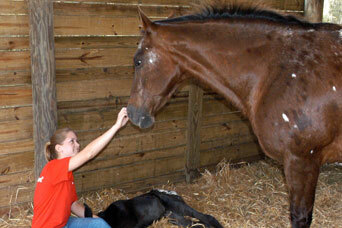 For information about ways in which you can help StarBrite Stables Equestrian Foundation please see our How to Help page.